Look further, there is a fine selection of gifts, and a good supply of basic groceries. Waves of customers come in each day, to meet over a drink, find bread or milk, or choose a needed card or present. Memories are made in the hours spent at the Hodge Podge. 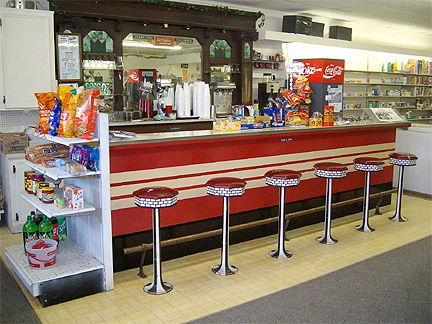 Come discover the lure of the soda fountain that makes the visit a true Kansas custom. Monday-Friday 9 a.m.- 5 p.m.; Saturday 9 a.m.-12 p.m.